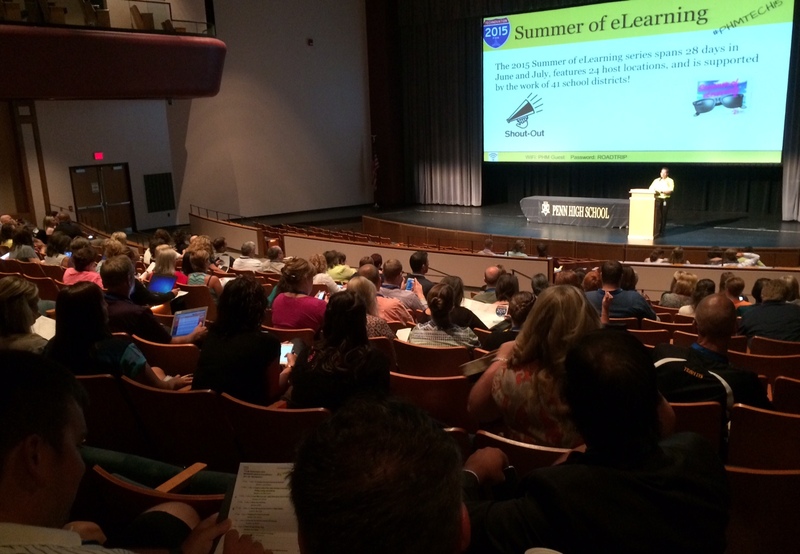 The Summer of eLearning is still going strong in the heart of July, with two conferences opening today on opposite sides of the state. 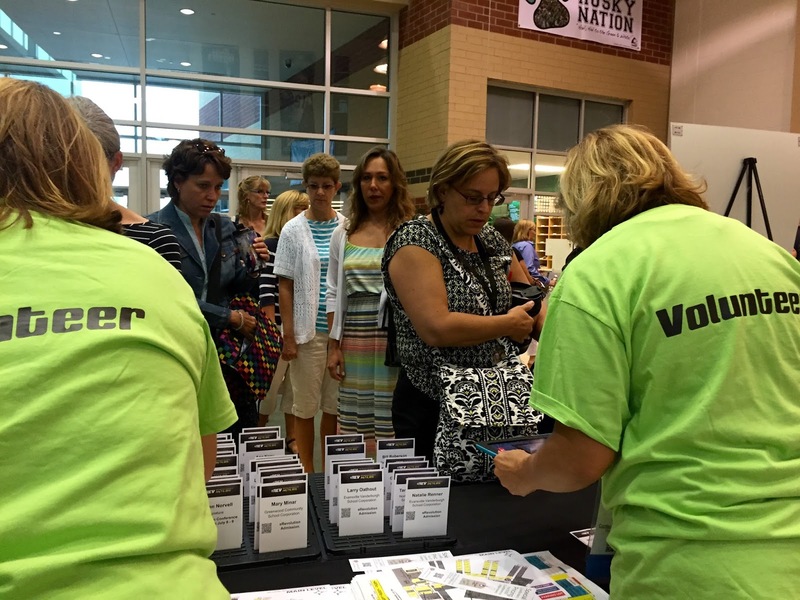 On the west side, Vincennes hosted their second eWonderland conference with about 300 in attendance. Participants packed in for keynote Leslie Fisher, Gadget Guru and Chief Geek at lesliefisher.com. 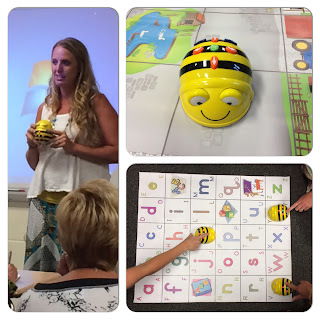 Fisher is known for sharing some of the hottest new tools making their way into classrooms, and this morning was no exception. She highlighted Arloon's Anatomy App and demonstrated Google Translate (available for iPhone and Android). Another hit was Osmo, a reflector system for iPad, evolving activities like Tangrams into more interactive experiences. In an early session, Kristen Taylor from Carmel Middle School and Al Parsons of Shelbyville High School (and STEM teacher of the year) shared how they are using drones to bring math class to new heights. Taylor described how she saw geometric shapes from the air in her second drone flight. The classroom applications were quick to follow. For concepts like scale and speed, drone video and stills shot by students provides some engaging content for measurement and analysis. Parsons suggested that there are grant possibilities for teachers looking to bring these tools into their math instruction. 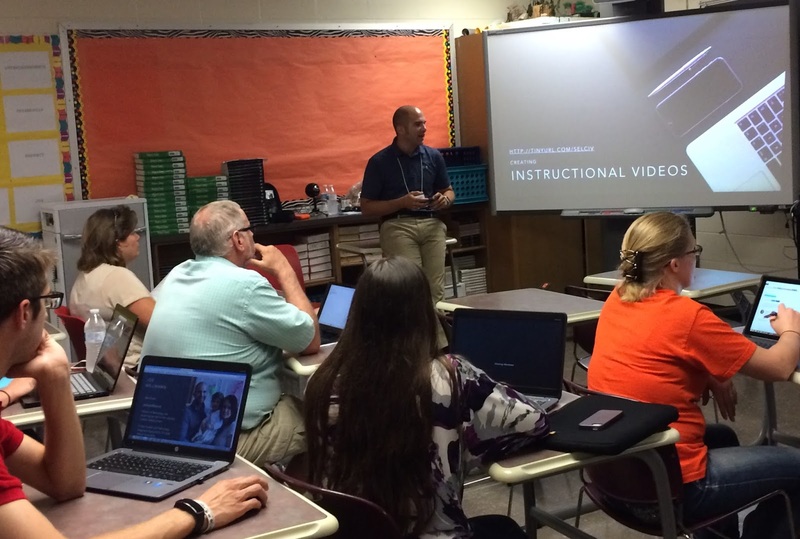 Another popular session was iMovie Training, where Chris Young and Kyle Kline took beginners deep into the features of this great program. The newest version allows you to build a general movie, or start with a trailer style template. With a little editing and title work, educators found an easy way to create an engaging hook for their next lesson. For another kick, they threw Dubsmash into the mix and edited together the snippets they created there. 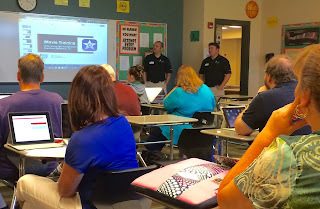 Click here to get their presentation on the iPad version of iMovie. Afternoon breakouts centered around content areas. So, social studies teachers gathered in one spot, while science folks were collaborating down the hall. 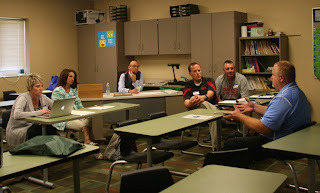 I sat in with a group of administrators facilitated by Five-Star's Yancy Unger and conference coordinator Barry Stone. This was a great opportunity for school leaders to share the questions they are dealing with in terms of starting a technology initiative. What grades should we begin with? How do you manage BYOD? What is the best way to support teachers in learning new tools? 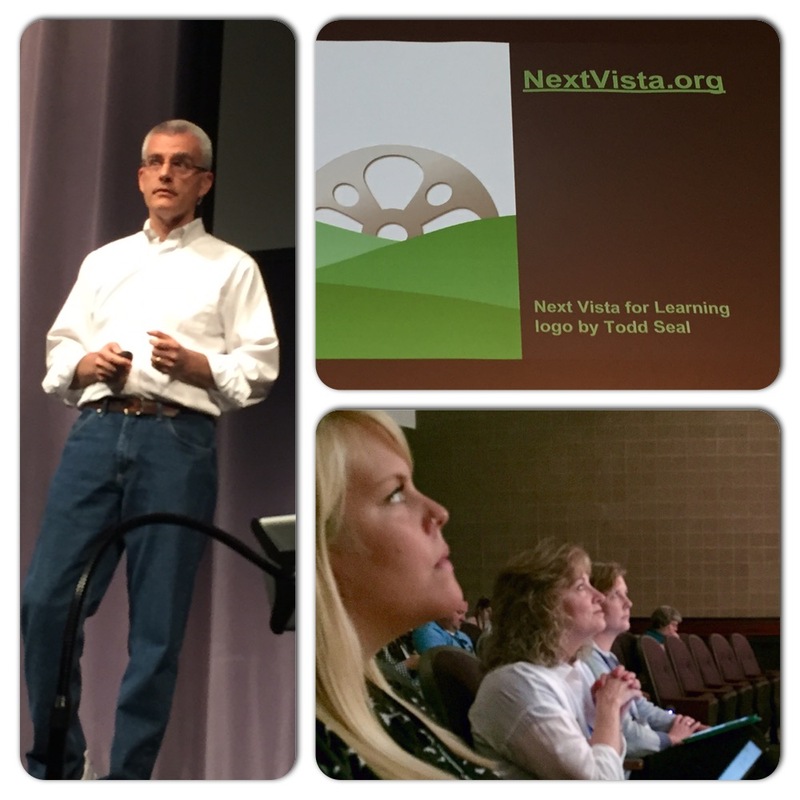 These conferences are always a great place for administrators to join in the learning! 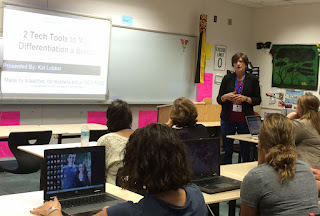 One more session with Leslie Fisher yielded dozens of powerful web 2.0 tools for schools. Fisher demonstrated Wufoo for creating online forms, and Permission Click for collecting digital permission slips and payments. If you didn't get a chance to catch her today, Fisher will make another stop in the Hoosier state two weeks from now at Catch the Wave in Lafayette. Richmond Community Schools (RCS) put a twist on their fourth Summer of eLearning Conference, which takes place today and tomorrow. Rob Tidrow, Director of Operations for RCS, welcomed the crowd to the legacy event. Tidrow noted the updated conference name, which moved away from emphasizing Tech to focusing on eLearning, and added, “We really want to get to the point where eLearning goes away and just becomes learning.” Another major change this year included their partnership with Western Wayne Schools as hosts of the conference. Educators from both school corporations are presenting in 6 breakout sessions to a record number of attendees. 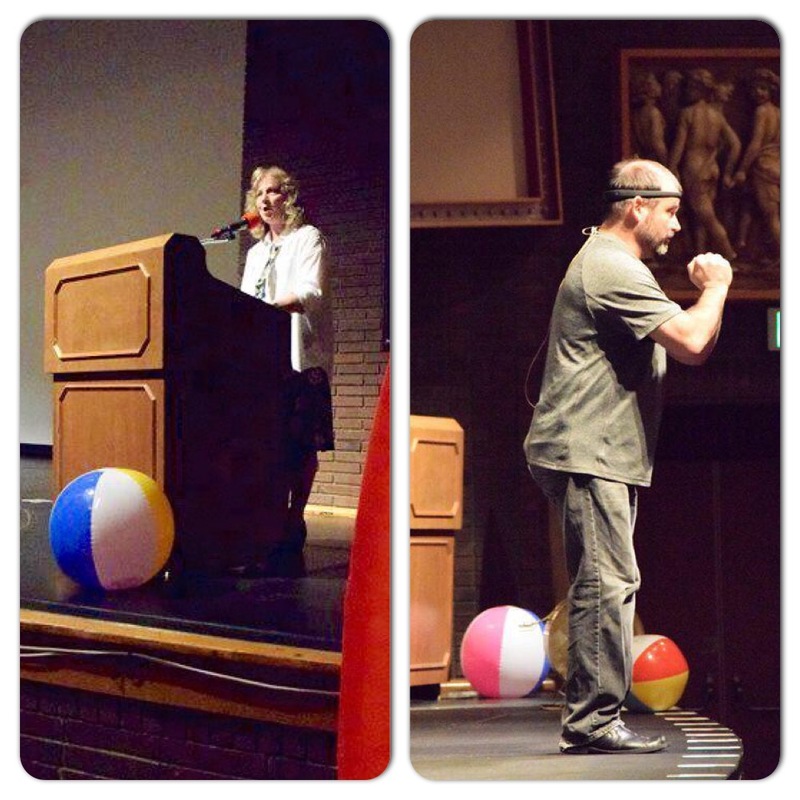 The free event welcomed over 300 educators from around the region. Superintendent of Public Instruction, Glenda Ritz, opened with acknowledging that educators are constantly retooling themselves as professionals and shared updates from the DOE. She spoke to providing relevance in our students’ school experience and commended Richmond for their work in this area. 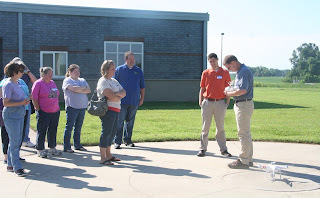 With a history of bringing relevant digital leaders such as George Couros and Will Richardson to keynote, Richmond introduced east central Indiana educators to Tom Murray today. 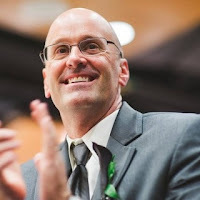 Murray currently serves as state and district digital learning director for the Alliance for Excellent Education located in Washington, DC. The Alliance leads projects such as Digital Learning Day and Future Ready. 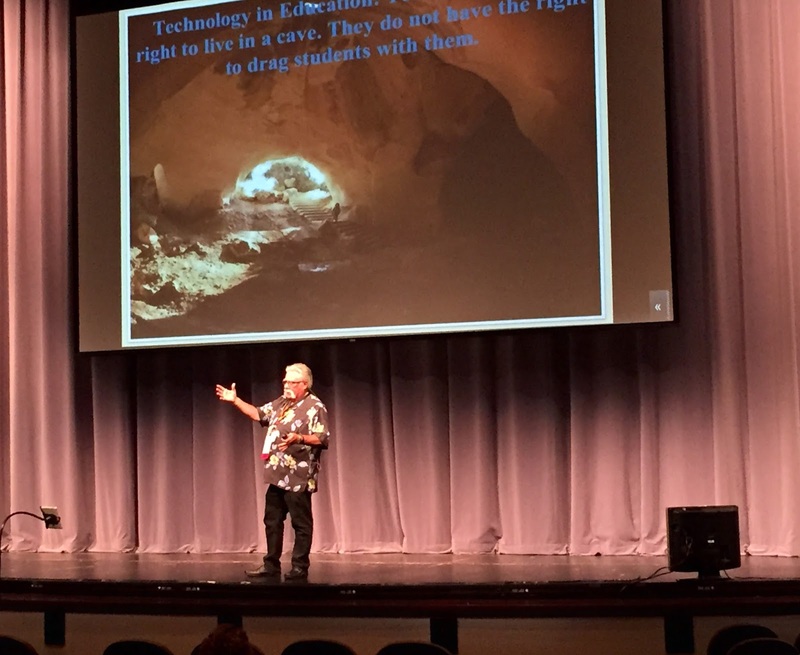 Murray's message was around the Future Ready initiative, but his keynote was far from a sit and get experience. He engaged participants in a 30- minute exercise where they were tasked with redesigning their students' learning environment. 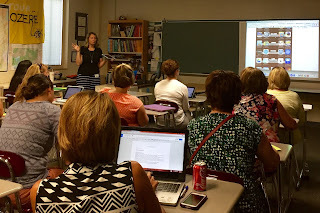 After Murray shared this video, Elizabeth Forward ReMakes Learning, he set the group to work. Paper and markers were distributed around the auditorium and teachers grouped up. For twenty minutes, group members collaborated to sketch out a space that honored student voice and in no way represented the classroom layouts that have been standard for the last century. Teams were asked to share their work on social media before completing a 10-minute pair and share exchange. 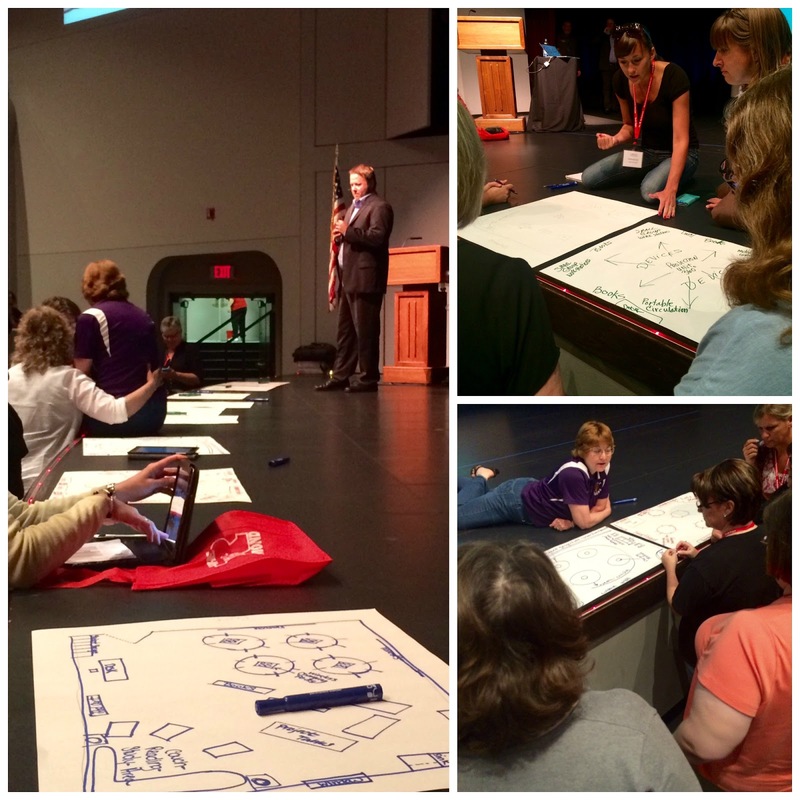 You can see all of the designs on the conference hashtag #RCSeLearn. Murray concluded his keynote with a heartfelt message on the value of relationships in education. He stressed that transformation cannot begin without this in place. Coincedentially, today is #semicolonEDU and Murray defintely made his mark here. Breakout sessions began after lunch. Digital content was a big focus in session one, which lends itself to a point that Rob Tidrow made in the opening session. The eLearning Expo 4 is intended to support the digital conversion process and allow educators to extend the ideas they have implemented by connecting with others with expertise in this work. 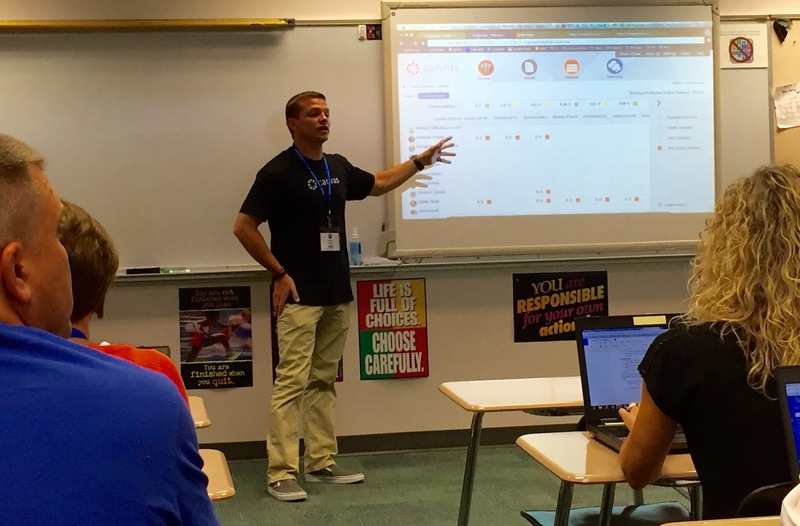 Richmond teacher, Clayton Smith shared an Overview of Holt McDougal Online ELA Curriculum and how he is replacing traditional resources with the personalized content. 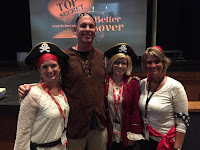 He gave practical tips on creating a successful environment that empowers students to be self-directed learners and spoke openly about the need for having a back-up plan for when the tech fails. In the library, Bill Campbell shared his experience with using Mathspace with iPads. 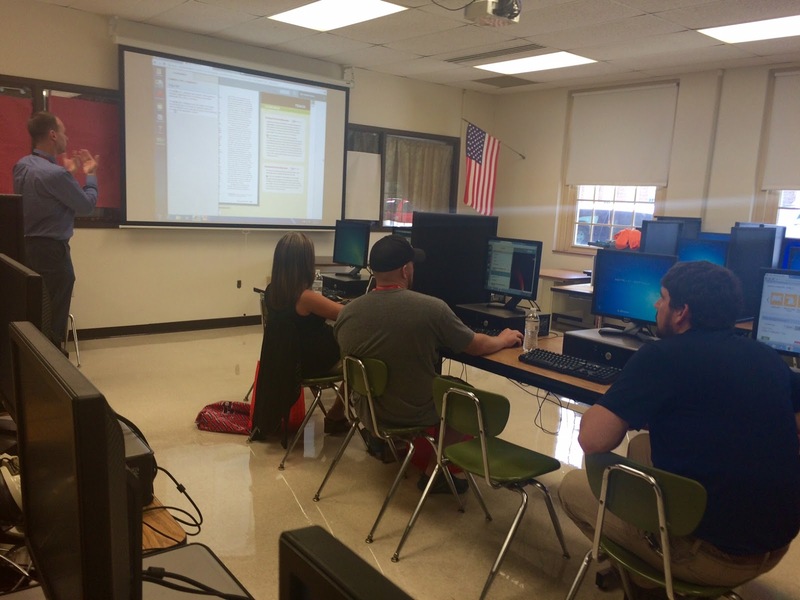 He spoke to the responsiveness of the app designers as he and his students worked with the resource. 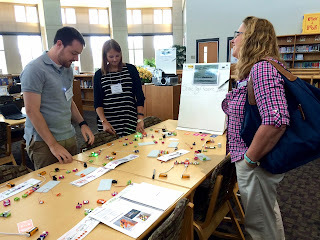 Attendees sat around tables and had rich discussions about the possibilities. Skyped into the session was a Mathspace representative who could answer questions. Across the hall, teachers filled the seats to learn Time-Saving Technology tips from educators and bloggers, Michelle Moon and Tracy South. 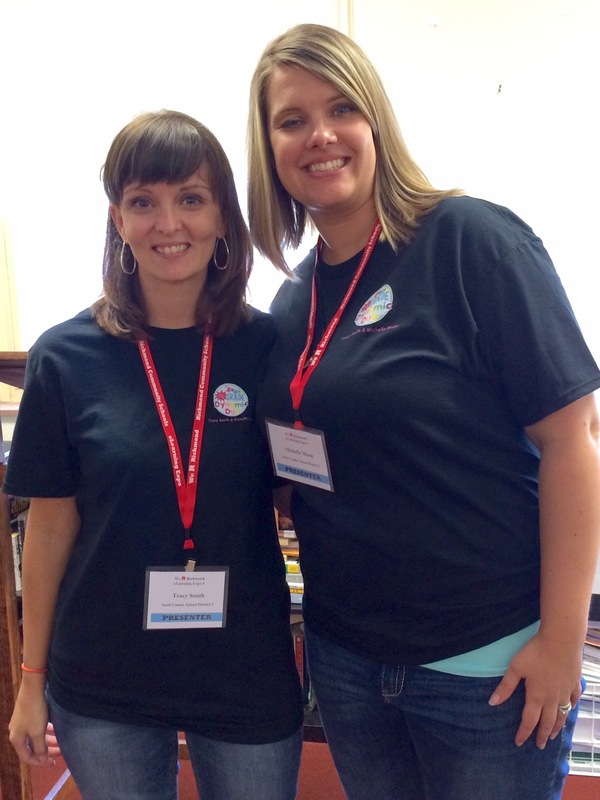 Known as the 4th Grade Dynamic Duo, these two began blogging to help colleagues see how to put technology integration into practice. 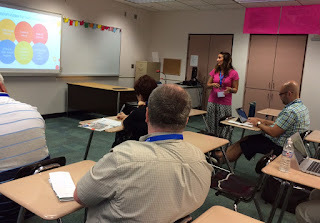 Educreations for formative assessment of fluency was one of many tools shared in their first session. In their second session, Test Prep with Technology, Tracy spoke to the importance of exposing your students to various types of test questions. Watch for these ladies in the 4th Grade Community of Practice and in more #INeLearn sharing! They are also on Twitter. 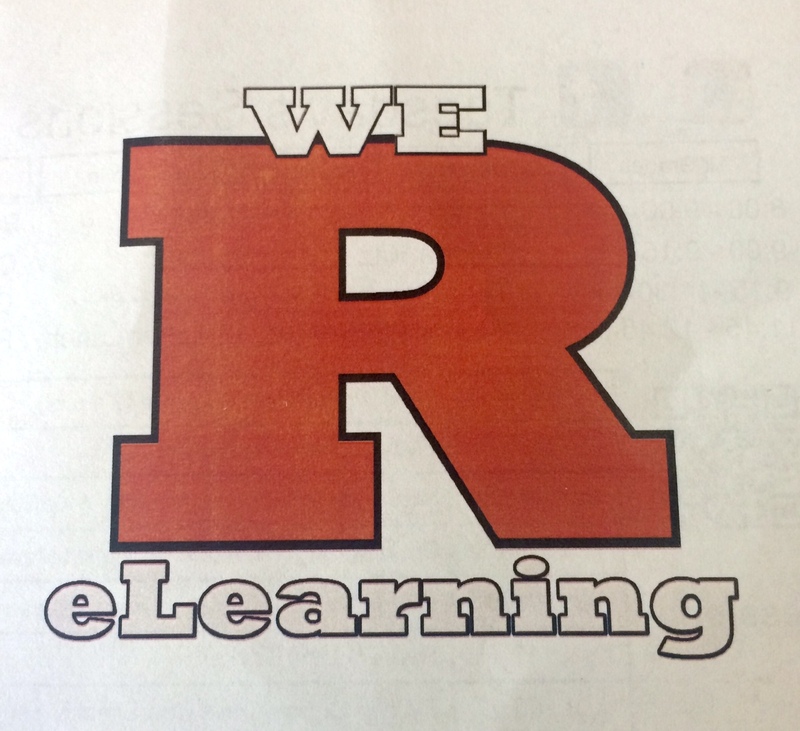 Follow #RCSeLearn tomorrow for more Richmond eLearning Expo 4 takeaways. If you have been following the various Summer of eLearning hashtags and INeLearn over the last couple of months, you have probably come across a Tweet that included “LIVE on Periscope…” like the one you see below. Perhaps you were curious and clicked the link only to find a message “Broadcast not found.” Or if you discovered the Tweet at the right time, you were transported into a live streamed event or archived recording of one. Learn more about Periscope in this post. 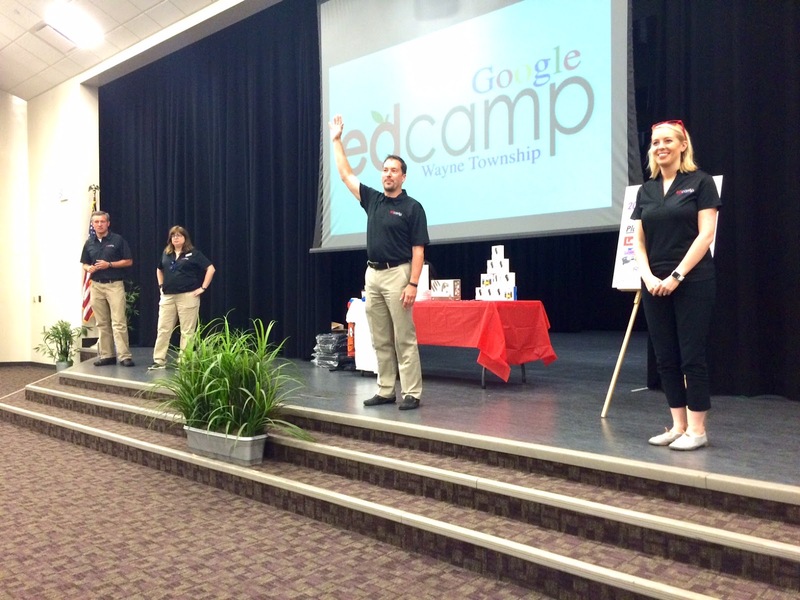 The past two summers Wayne Township has sponsored a Google EdCamp and invited educators from around the state to join. This year, as an official Summer of eLearning event, they took what they learned from their earlier experience and magnified the good. Google EdCamp opened its doors to 400 Indiana educators this morning. Attendees were greeted by a team of student leaders who orientated them on the ticket system, handed out the swag, and directed them to the session planning board. Pete Just, Chief Technology Officer, served as Master of Ceremonies in the opening session. Following introductions of the Google EdCamp team, Just explained the philosophy behind the edcamp model of professional learning. 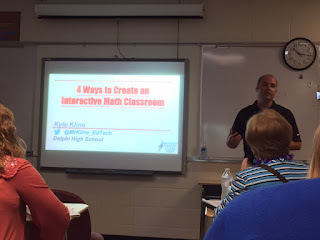 He prepared the packed auditorium for their first breakout session by demonstrating how everyone in the room is a presenter and a learner. After getting everyone on their feet and in the edcamp learner mindset, he left participants with this message, "You can come with problems, and you can leave with solutions. If you leave here and this isn't true, you didn't ask the questions." With a full session schedule, there were sessions ranging from how-tos to practical strategies. 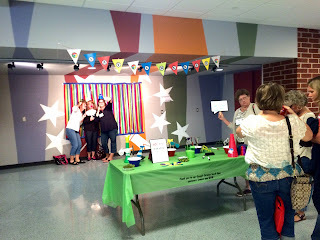 As you walked through the halls, you saw everything from packed rooms to small groups clustered around a table. 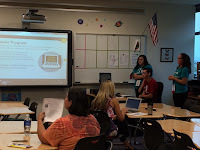 And regardless of the size of the sessions, you heard rich discussions being facilitated by educators. When your brain got too full, you could take a break in any of the lounge-like areas in the building, play corn hole (indoors away from the drizzle outdoors), take a group photo, or explore the Makerspace in the Media Center. Leslie Preddy from Perry Township joined the Wayne Township team and created a MakerSpace in the Chapel Hill 7th/8th Grade Center media center. 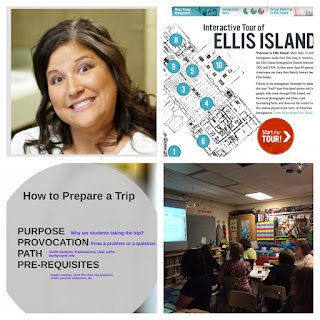 She brought a dozen activities that she considers the gateaway activities to encourage kids to start thinking about the possibility of making. "Students are not used to thinking with their heads and their hands at the same time," Preddy explained. The inquisitive teacher comments revealed students aren't the only ones craving this kind of experience! And the learning continues even after the last picture is taken and the final doorprize ticket is drawn. 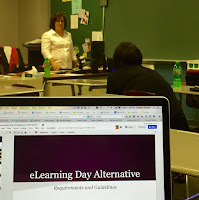 Michele Eaton is leading a virtual Google EdCamp Continued #INeLearn Chat to wrap up the day. 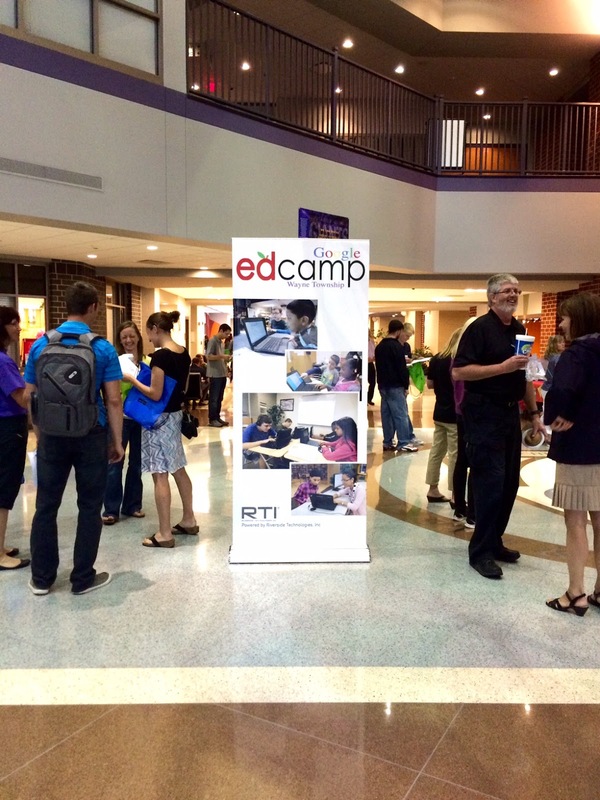 If you are interested in the EdCamp format, Indiana boasts two other events. 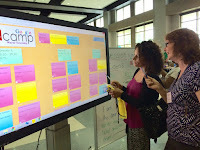 To learn about EdCamp Indy contact Susie Highley. 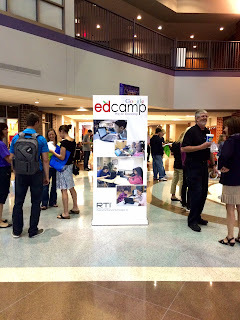 And for EdCamp Fort Wayne, contact Jason Bodnar. 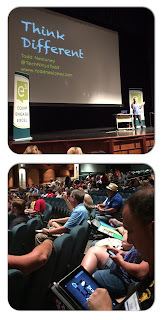 To see what was shared via Twitter, check out the hashtags #GoogleEdCamp and #GoogleEdu. 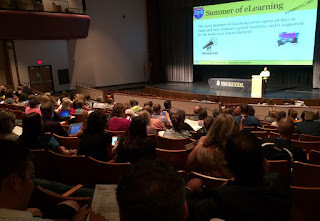 The largest gathering of the Summer of eLearning can often be found in Evansville. This year, the eRevolution conference had nearly 900 educators in attendance! These participants were treated to more than 200 sessions, dozens of sponsor tables, a student-hosted technology playground, and a giant maker space! Among the new additions to the conference this year, the eRev Scavenger Hunt App! Attendees download the app and used it to find bluetooth beacons, collect badges and register for prizes. 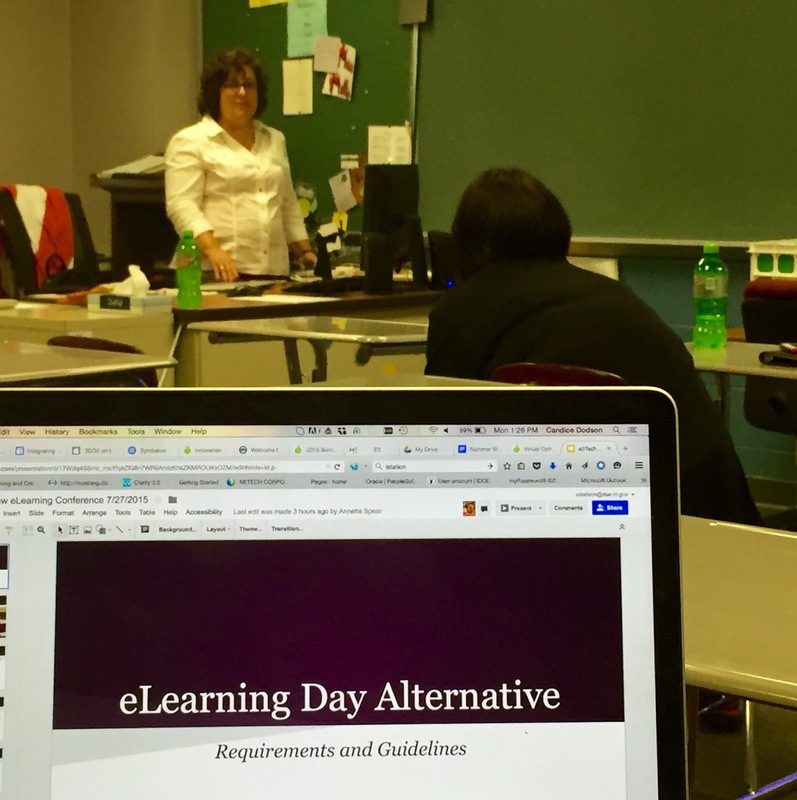 Jennifer Brandt led an early session, supported by Harrison eLeaders, students who help teachers incorporate technology by providing training and support for new tools. 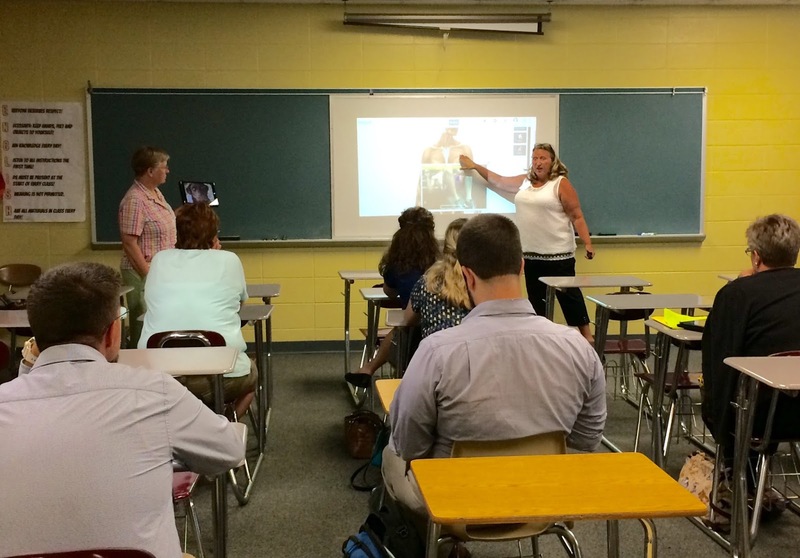 They modeled the use of an online presentation tool called emaze, as well as the ever-popular flashcards in Quizlet. One of the Harrison eLeaders, also gave high praise to Mathway, saying: "My teacher taught us the way it made sense to him, and sometimes the book showed it a different way. Every student learns differently, and Mathway just let us learn it the way it made sense to us." 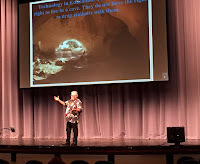 “There are two kinds of educators today- the connected educator and the unconnected educator.“ Tom Whitby, author of The Relevant Educator: How Connectedness Empowers Learning explored the how and why connected educators are changing learning for today’s students and themselves. 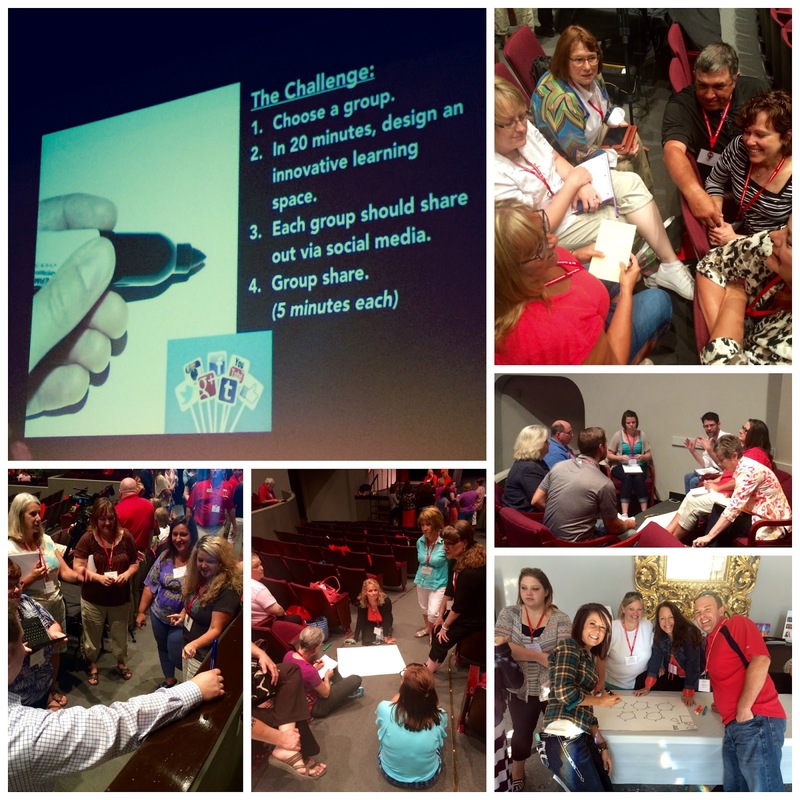 Developing your PLN is key to expanding your own learning and building your skills and tools for teaching. 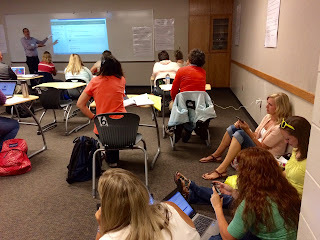 Twitter is the place to connect with other learners. Follow those that share your passion and thoughts and more importantly those that challenge your ideas. Participate in Twitterchats a great way to engage in discussions and “Learn it today- Use it tomorrow” resources. 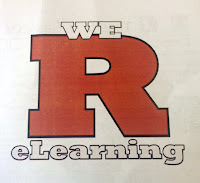 Edweb is another good place to start connecting with fellow educators. Indiana educators can connect with colleagues around the state through the #INeLearn hashtag. Teachers and administrators gathered in the auditorium to spend time with Superintendent of Public Instruction Glenda Ritz. After the a brief IDOE overview, Superintendent Ritz opened the floor for questions. 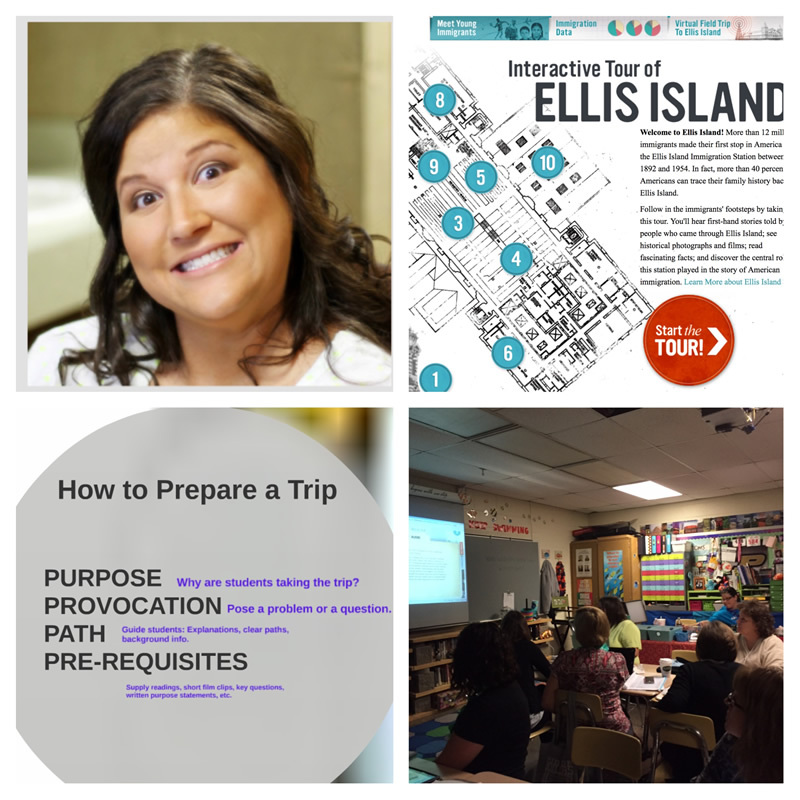 Topics covered teacher preparation and retention, evaluation, accountability, assessments and everything you want to know about Indiana education and weren’t afraid to ask. Ritz shared her views and encouraged educators to look forward, positive changes for the profession are coming! The superintendent then tuned in to the keynote delivered by Rushton Hurley, who encouraged teachers to help students find their own passion and create learning experiences that are truly memorable. One of the most powerful sessions of the eREV was the Keynotes from the Classroom, Ted-like presentations from three EVSC classroom teachers: Amanda Bussey, Lisa Boeglin, and Jon Carl. These educators inspired, challenged and brought both tears and laughter to the audience while they shared their thoughts on the teaching profession, the process of learning and the impact educators have on their students.